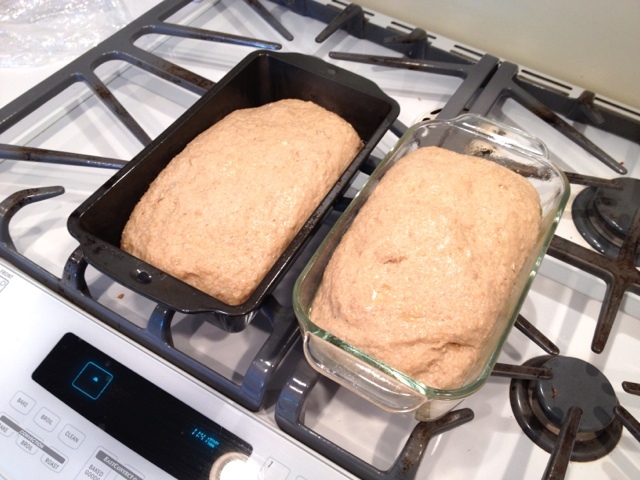 I've been wanting to get back into bread making - we go through a lot of bread in this house. My kids love bread - they love toast and sandwiches, and just bread. And if you read the ingredients list of a lot of breads, it can be a little scary. I buy good bread, and good bread is expensive. So I thought I'd try making my own. I used to make bread years ago, but then I was more focused on white breads - french, rustic country style, sourdough, etc. 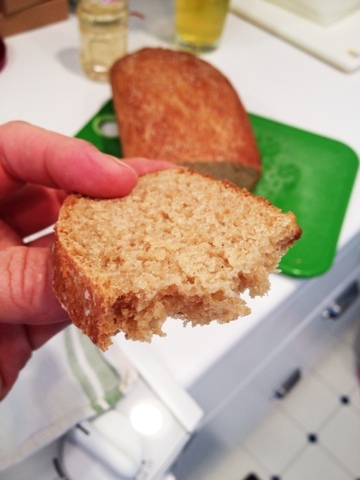 But now my motivation was about finding a good whole wheat sandwich loaf - healthy for my kids, with a little sweetness, and an easy size for toast and sandwiches. 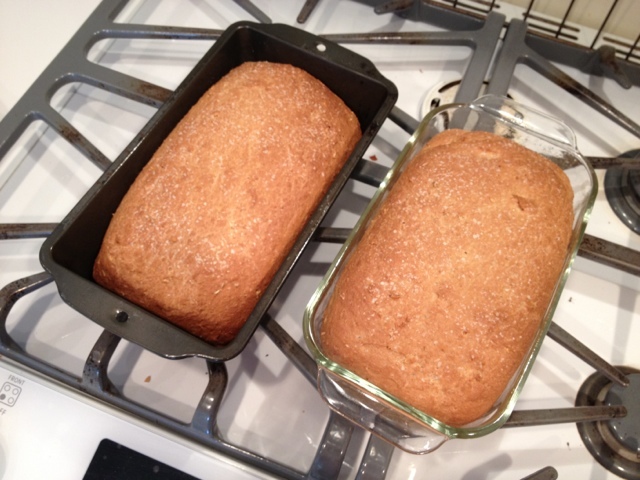 I had some criteria - it needed to be all whole wheat flour, very few (all natural) ingredients, and easy. The recipe I settled on is very simple - it's all done in my kitchenaid mixer - no extra kneading, no adding things a little at a time, and only 6 ingredients for the basic version. I found a couple recipes online, and adapted a bit to suit my style. 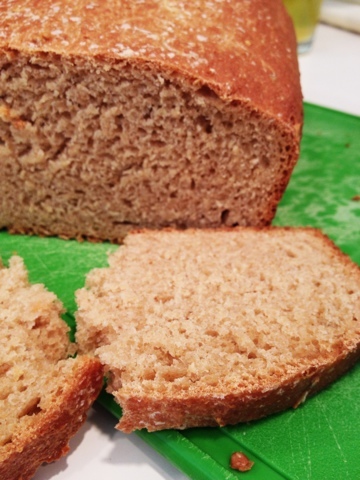 This recipe is vegan - but a little butter certainly could make it even better! I found a lot of recipes that called for a mix of flours, and some milk, and dry milk powder, and sugar, and dough conditioner, etc. - too much stuff! This one is very basic. Mix the water, oil, honey and yeast. mix again vigorously for a couple minutes - until it's pulling away from the bowl (I added an extra 1/2 cup flour at this point). cover the mixer and let rise in the mixer bowl until at least doubled - in my kitchen this was about 90 minutes. mix again for a few minutes until pulling away and forming a nice ball again. rise again in the loaf pans - spray a little oil on top, cover with plastic, set on top of the stove as the oven preheats (nice and warm). So I made this basic recipe last week and it was pretty good. 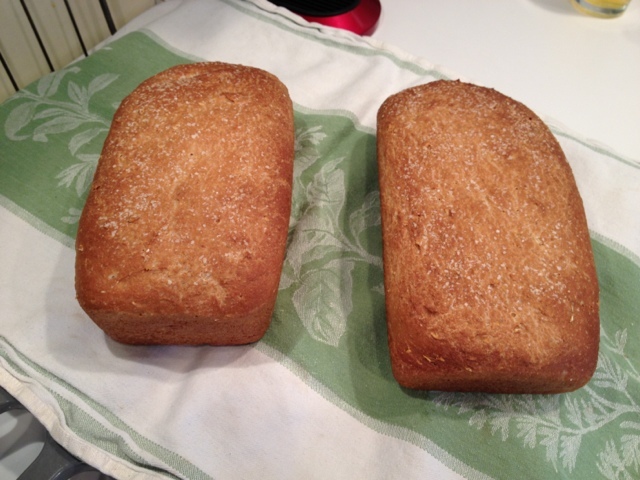 I used Bob's Red Mill Organic wheat flour. 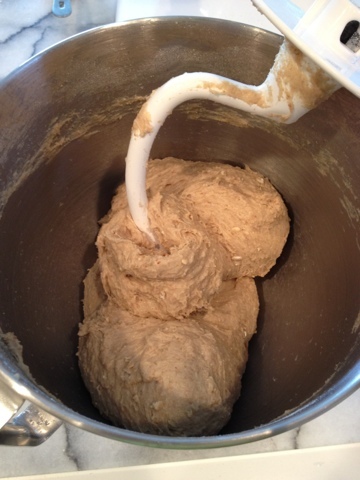 Today I cut back on the flour - started with 4 cups and added an extra 1/2 cup while mixing - and I added 1 cup of rolled oats and 1 cup of wheat germ. I thought a little extra texture would be nice. And the oil I am using is an organic coconut oil. The dough is a bit sticky - but plopping a sticky mound of dough in a greased loaf pan worked ok, and I didn't want to dry it out by adding more flour. I think it turned out great - and my four little food critics seemed to agree, they were gobbling it up as quick as I could slice it. I think it will be very good in the morning toasted with a little butter, or as a nice cheese sandwich for a five year old's lunch. Not bad for having not made bread in 10 years - and I expect this to get even better as I keep experimenting.